We’re so thrilled to feature Dolphin Pool and Spa in today’s SSP Business Profile. The Caldera spa and custom vinyl pool builder from Minnesota approached us needing a web presence face-lift. An engaging, introductory video about the company. A web news feed to create a constant flow of communication to current and prospective clients. Optimized, branded social media accounts to build relationships and engage with visitors and customers. Overall, we wanted to provide Dolphin with a strong web presence and content marketing strategy using several key components. We created a search engine optimized, mobile-friendly site that visitors could easily find and access. We showcased their best work, tagging new pool, spa, and construction photos so online customers would have the best idea of what to expect. We wanted to provide Dolphin’s web visitors with a quick, engaging way to get to know the company through an introductory video. Finding a pool and spa builder can often be an extensive, very expensive process. Quickly being able to navigate and find a pool builder you can get to know and trust is important. We are very excited that we were able to provide Dolphin with the strong web marketing strategy that makes a splashing impression. 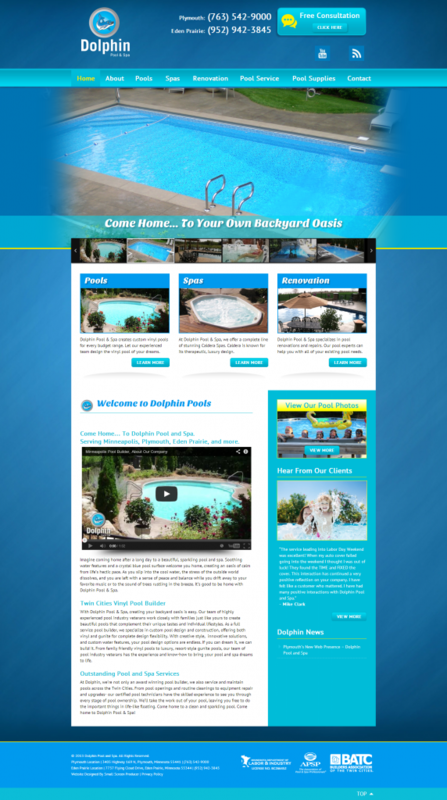 If you’re interested in enhancing your website with key marketing components like Dolphin Pool & Spa, just contact us! We offer a free Web Presence Report that will give provide you with a list of recommendations and tips on how to get started. Click below for more information.